Applied Micro Showcases World’s First 64-bit ARMv8 Core at ARM Techcon 2011, Santa Clara California. The day ARM announced the first 64-bit ARMv8 instruction set architecture, AppliedMicro unveiled the launch of the industry’s first 64-bit ARM “Server-on-a-Chip” solution. Most of the presentation is used to explain the competitive advantage this platform would bring including TCO reduced by 30%. 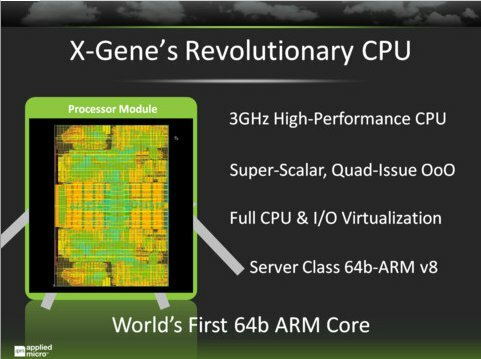 There is also an (underwhelming) demonstration of X-Gene based on Xilinx Virtex-6 FPGA running Server SoC consisting of ARM-64 CPU complex, coherent CPU fabric, high performance I/O network, memory subsystem along with fully functional SoC subsystem. The FPGA platform and tools will be available for customer evaluation by the first half of 2012. Redhat will be in charge of implementing ARMv8 support in Linux and this will be part of Fedora for ARM in the future. The platform will run LAMP: Linux, Apache, MySQL and Perl/PHP/Python. The silicon will be available in H2 2012 and they expect most of the key software (developed on the FPGA boards) will be ready at the same time.